The first reported case of MG is likely to be that of the Native American Chief Opechancanough, who died in 1664. It was described by historical chroniclers from Virginia as “the excessive fatigue he encountered wrecked his constitution; his flesh became macerated; the sinews lost their tone and elasticity; and his eyelids were so heavy that he could not see unless they were lifted up by his attendants… he was unable to walk; but his spirit rising above the ruins of his body directed from the litter on which he was carried by his Indians”. In 1672, the English physician Willis first described a patient with “fatigable weakness” involving ocular and bulbar muscles described by his peers as “spurious palsy.” In 1877, Wilks (Guy’s Hospital, London) described the case of a young girl after pathological examination as “bulbar paralysis, fatal, no disease found". In 1879, Wilhelm Erb (Heidelberg, Germany) described three cases of myasthenia gravis in the first paper dealing entirely with this disease, whilst bringing attention to features of bilateral ptosis, diplopia, dysphagia, facial paresis, and weakness of neck muscles. In 1893, Samuel Goldflam (Warsaw, Poland) described three cases with complete description of myasthenia and also analyzed the varying presentations, severity, and prognosis of his cases. Due to significant contributions of Wilhelm Erb and later of Samuel Goldflam, the disease was briefly known as “Erb’s disease” and later for a brief time, it was called “Erb-Goldflam syndrome”. In 1934, Mary Walker realized that MG symptoms were similar to those of curare poisoning, which was treated with physostigmine, a cholinesterase inhibitor. She demonstrated that physostigmine promptly improved myasthenic symptoms. In 1937, Blalock reported improvement in myasthenic patients after thymectomy. Following these discoveries, cholinesterase inhibitor therapy and thymectomy became standard and accepted forms of treatment for MG. In 1959-1960, Nastuk et al. and Simpson independently proposed that MG has autoimmune etiology. In 1973, Patrick and Lindstrom were able to induce experimental autoimmune MG (EAMG) in a rabbit model using muscle-like acetylcholine receptor (AChR) immunization. In the 1970s prednisone and azathioprine were introduced as treatment modalities for MG followed by plasma exchange that was introduced for acute treatment of severe MG, all supporting the autoimmune etiology. Myasthenia Gravis is a relatively rare an autoimmune neuromuscular disease leading to fluctuating muscle weakness and fatigue. Muscle weakness is caused by circulating antibodies that block acetylcholine receptors at the postsynaptic neuromuscular junction, inhibiting the excitatory effects of the neurotransmitter acetylcholine on nicotinic receptors at neuromuscular junctions. The annual incidence of MG is approximately 10 to 20 new cases per million with a prevalence of about 150 to 200 per million. Its prevalence has been increasing over the past several decades secondary to better recognition and increased survival. The age of onset is characterized by a bimodal distribution with an early incidence peak in the 2nd to 3rd decades affecting young women and a late peak in the 6th to 8th decades that is primarily seen in men. In Myasthenia gravis (MG) antibodies form against nicotinic acetylcholine (ACh) postsynaptic receptors at the neuromuscular junction (NMJ) of the skeletal muscles.The basic pathology is a reduction in the number of ACh receptors (AChRs) at the postsynaptic muscle membrane brought about by an acquired autoimmune reaction producing anti-AChR antibodies. NMJ findings that influence susceptibility to muscle weakness and MG: EPP generated in normal NMJ is larger than the threshold needed to generate the postsynaptic action potential by a measure of multiple folds. This neuromuscular transmission “safety factor” is reduced in MG patients. Reduction in number or activity of the AChR molecules at the NMJ decreases the EPP, which may be adequate at rest; but when the quantal release of ACh is reduced after repetitive activity, the EPP may fall below the threshold needed to trigger the action potential. This translates as clinical muscle weakness, and when EPP, at rest is consistently below the action potential threshold, it leads to persistent weakness. The usual initial complaint is a specific muscle weakness rather than generalized weakness - frequently ocular (eye) symptoms. Extraocular muscle weakness or ptosis is present initially in 50% of patients and occurs during the course of illness in 90% of patients. Patients also frequently report diploplia (double vision). The disease remains exclusively ocular in 10 - 40% of patients. Rarely, patients have generalized weakness without ocular muscle weakness. Bulbar muscle weakness is also common, along with weakness of head extension and flexion. Limb weakness may be more severe proximally than distally. Isolated limb muscle weakness is the presenting symptom in fewer than 10% of patients. Weakness is typically least severe in the morning and worsens as the day progresses. Weakness is increased by exertion and alleviated by rest. Weakness progresses from mild to more severe over weeks or months, with exacerbations and remissions. Weakness tends to spread from the ocular to facial to bulbar muscles and then to truncal and limb muscles. About 87% of patients have generalized disease within 13 months after onset. Less often, symptoms may remain limited to the extraocular and eyelid muscles for many years. MG with no detectable AChR and muscle-specific tyrosine kinase (MuSK) antibodies. Tensilon (Edrophonium Chloride) Test:Edrophonium chloride is a short-acting acetylcholinesterase inhibitor that prolongs the duration of action of acetylcholine at the NMJ. Edrophonium is administered intravenously and the patient is observed for objective improvement in muscle strength particularly the eyelid ptosis and/or extraocular muscle movement. Only unequivocal improvement in strength of a sentinel muscle should be accepted as a positive result. Patients must be connected to cardiac and blood pressure monitors prior to injection because of possible risk of arrhythmia and hypotension. Atropine should be available at bed side for use if an adverse event like severe bradycardia (heart rate below 37) develops. Side effects from Edrophonium include increased salivation and sweating, nausea, stomach cramping, and muscle fasciculation. Hypotension and bradycardia are infrequent and generally resolve with rest in the supine position. Tensilon test has a sensitivity of 71.5%–95% for the diagnosis of MG.
Ice Pack Test:The ice pack test is a nonpharmacological test which could be considered in patients with ptosis when the Edrophonium test is contraindicated. It is performed by placing an ice pack over the eye for 2–5 minutes and assessing for improvement in ptosis. Electrophysiological Tests:The two principal electrophysiologic tests for the diagnosis of MG are repetitive nerve stimulation study and single fiber electromyography. i)Repetitive nerve stimulation tests neuromuscular transmission. It is performed by stimulating the nerve supramaximally at 2-3 Hz. A 10% decrement between the first and the fifth evoked muscle action potential is diagnostic for MG. In the absence of the decrement, exercise can be used to induce exhaustion of muscles and document decrement. The test is abnormal in approximately 75% of patients with gMG and 50% of patients with oMG. ii)Single-fiber electromyography (SFEMG) is the most sensitive diagnostic test for MG. It is done by using a special needle electrode that allows identification of action potentials from individual muscle fibers. It allows simultaneous recording of the action potentials of two muscle fibers innervated by the same motor axon. The variability in time of the second action potential relative to the first is called “jitter.” In MG, the jitter will increase because the safety factor of transmission at the neuromuscular junction is reduced. SFEMG reveals abnormal jitter in 95%–99% of patients with MG if appropriate muscles are examined. Although highly sensitive, increased jitter is not specific for primary NMJ disease. It may be abnormal in motor neuron disease, polymyositis, peripheral neuropathy, Lambert-Eaton myasthenic syndrome (LEMS), and other neuromuscular disorders. However, it is specific for a disorder of neuromuscular transmission when no other abnormalities are seen on standard needle EMG examination. The most commonly used immunological test for the diagnosis of MG measures the serum concentrations of Anti-AChR antibodies and is highly specific for myasthenia gravis. False positives are rare and may occur with low titers in LEMS (5%), motor neuron disease (3% to 5%), and polymyositis (<1%). The sensitivity of this test is approximately 85% for gMG and 50% for oMG. Anti-AChR antibody concentrations cannot be used to predict the severity of disease in individual patients since the concentration of the antibodies does not correlate with the clinical picture. Seronegativity may occur with immunosuppression or if the test is done too early in the disease. As indicated above, striated muscle antibodies against muscle cytoplasmic proteins (titin, myosin, actin, and ryanodine receptors) are detected mainly in patients with thymomatous MG and also in some thymoma patients without MG. The presence of these antibodies in early-onset MG raises the suspicion of a thymoma. Titin antibodies and other striated muscle antibodies are also found in up to 50% of patients with late-onset and nonthymomatous MG and are less helpful as predictors of thymoma in patients over 50 years. Anti-KCNA4 antibodies might be a useful marker to identify patients with thymoma but can be also seen in myocarditis/myositis. Patients with gMG who are anti-AChR antibody negative should be tested for anti-MuSK antibodies which are found in approximately 40% of patients in this group. As noted, low-affinity anti-AChR antibodies binding to clustered AChRs have been found in 66% of sera from patients with seronegative gMG. Whether low-affinity antibodies are present in oMG remains to be determined, but this cell-based assay might eventually provide a more sensitive diagnostic test in this subgroup. Chest CT or MRI is done in all patients with confirmed MG to exclude the presence of a thymoma. Iodinated contrast agents should be used with caution because they might exacerbate myasthenic weakness. MG often coexists with thyroid disease, so baseline testing of thyroid function should be obtained at the time of diagnosis. Myasthenia Gravis Composite Scale - Burns TM, Conaway M, Sanders DB. Neurology, 2010; 74(18): 1434–1440. Quantitative Myasthenia Gravis (QMG) Test - The Myasthenia Gravis Foundation of America, Inc (2000). Management of MG should be individualized according to patient characteristics and the severity of the disease. There are two approaches for management of MG based on the pathophysiology of the disease. 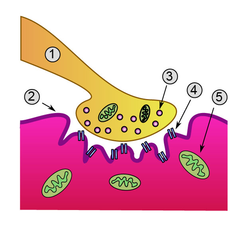 The first is by increasing the amount of Acetylcholine that is available to bind with the postsynaptic receptor using an acetylcholinesterase inhibitor agent, and the second is by using immunosuppressive medications that decrease the binding of acetylcholine receptors by antibodies. Surgical treatment is strongly recommended for patients with thymoma. The clinical efficacy of thymectomy in other situations has been questioned because the evidence supporting its use is not solid. Surgical treatment is strongly recommended for patients with thymoma. The benefit of thymectomy evolves over several years. Thymectomy is advised as soon as the patient’s degree of weakness is sufficiently controlled to permit surgery. Patients undergoing surgery are usually pretreated with low-dose glucocorticoids and I V Ig. Thymectomy may not be a viable therapeutic approach for anti-MuSK antibody-positive patients because their thymi lack the germinal centers and infiltrates of lymphocytes that characterize thymi in patients who have anti-AChR antibodies. This supports a different pathologic mechanism in anti-MuSK Ab-positive and anti-AChR Ab-positive MG. Most experts consider thymectomy to be a therapeutic option in anti-AChR Ab-positive gMG with disease onset before the age of 50 years. Rehabilitation alone or in combination with other forms of treatment can relieve or reduce symptoms for some people with MG.
MG patients should find the optimal balance between physical activity and rest. It is not possible to cure the weakness by active physical training. However, most MG patients are more passive than they need to be. Physical activity and physical training of low to medium intensity is recommended. One study showed a clear benefit from a strength training exercise program for a group of patients with mild to moderate MG, concluding "physical training can be carried out safely in mild MG and provides some improvement of muscle force". Myasthenic crisis is defined as respiratory muscle weakness that is severe enough to necessitate intubation or delay extubation. Prognosis in myasthenic crisis has dramatically improved over the last 4 decades from a mortality rate of 75% to the current 4.5%. It is prudent to closely observe MG patients with respiratory difficulty in a supervised setting. The forced vital capacity (FVC) and the negative inspiratory force (NIF) are the main respiratory parameters for monitoring, and both should be measured frequently during the hospital admission. Abnormalities of arterial blood gases are insensitive measures of respiratory muscle weakness as they often are late-occurring abnormalities only after the onset of life-threatening respiratory failure. Elective intubation should be considered if serial FVC measurements show values less than 20 mL/kg or if the NIF is less than 30 cm H2O. Rapid induction therapies such as plasmapheresis or IVIg should be considered. In most cases, initiation or maintenance of high-dose corticosteroids is also necessary. With treatment, people with MG have a normal life expectancy. Some combination of medication, thymectomy, and other therapies enables most myasthenics to lead normal or near normal lives. Sometimes people experience remission. However, for some people quality of life is affected significantly - either by severity of the disease or severity of side effects from the medication. Generally, those who are quickly diagnosed and receive effective treatment have the best outcomes. Medical treatment involves the use of anticholinesterase agents, immunosuppressive drugs, plasmapheresis, and gammaglobulin, with reported complete clinical remission rates (CCRRs) as low as 15%. Accordingly, thymectomy has become an increasingly accepted procedure for treatment of MG, as it can achieve CCRRs as high as 80% in accordance with most of the reports published in the literature. ↑ Robertson N. Enumerating neurology. Brain 2000; 123:663–664. ↑ Keesey JC. Clinical evaluation and management of myasthenia gravis. Muscle Nerve 2004; 29:484–505.